Objectives To assess knowledge deficits of patients/parents and prevention strategies. Methods After receiving ethics approval, we performed a controlled, quasi-randomised, prospective intervention study. We enrolled patients/parents involved in managing oral medicines in three groups: control (routine care only), handbook intervention and pharmaceutical counselling intervention group. At baseline and after the interventions, we assessed patients’/parents’ knowledge deficits (incorrect or missing answers) by questionnaire. Results We enrolled 64 patients/parents. At baseline, knowledge deficits among the groups were similar: 17% in controls, 22% in the handbook group and 24% in the pharmaceutical counselling group. After the intervention, knowledge deficits decreased to 13% in the handbook group and to 8% in the pharmaceutical counselling group (NS; p=0.003 compared with controls, respectively). For controls, knowledge deficits remained almost unchanged (19%). Results for the pharmaceutical counselling group showed a strong correlation between baseline knowledge deficits and the extent of the deficit decrease after the intervention (τ=−0.74; p<0.001), whereas no significant correlation was found in the control or handbook group. Conclusions In paediatric oncology, patients’/parents’ knowledge of managing oral medicines was improved. Pharmaceutical counselling substantially reduced high knowledge deficits but no significant improvement was seen with the handbook approach. Pharmaceutical counselling should be offered to patients/parents with high knowledge deficits to reduce errors in managing medicines and increase safety. In this controlled pilot study in a paediatric oncology unit, we aimed at identifying knowledge deficits of patients and their parents in managing oral antineoplastic agents. Subsequently, we aimed at assessing two intervention strategies to prevent these knowledge deficits—namely, a handbook designed to provide information for patients/parents and pharmaceutical counselling. The study protocol was approved by the local ethics committee and informed consent was given by the patients (children and adolescents) and their parents. We carried out this study with patients from a 16-bed inpatient unit and the outpatient unit at a department of paediatric oncology, haematology and haemostaseology of a university hospital. The study unit sees about 45 patients newly diagnosed with an oncological or haematological disease each year. Neither electronic support nor a clinical pharmacy service were established at the time of the study. All patients and their parents visiting the study unit were invited to join the study. First, the person (patient or parent) responsible for managing the medicines at home was handed a questionnaire. Patients were eligible for inclusion if they were receiving or had had recent treatment with oral drugs and were being treated in the study unit. Patients and/or their parents were enrolled only if they were able to complete the questionnaire and understand the aims and meaning of the study (including sufficient language skills). 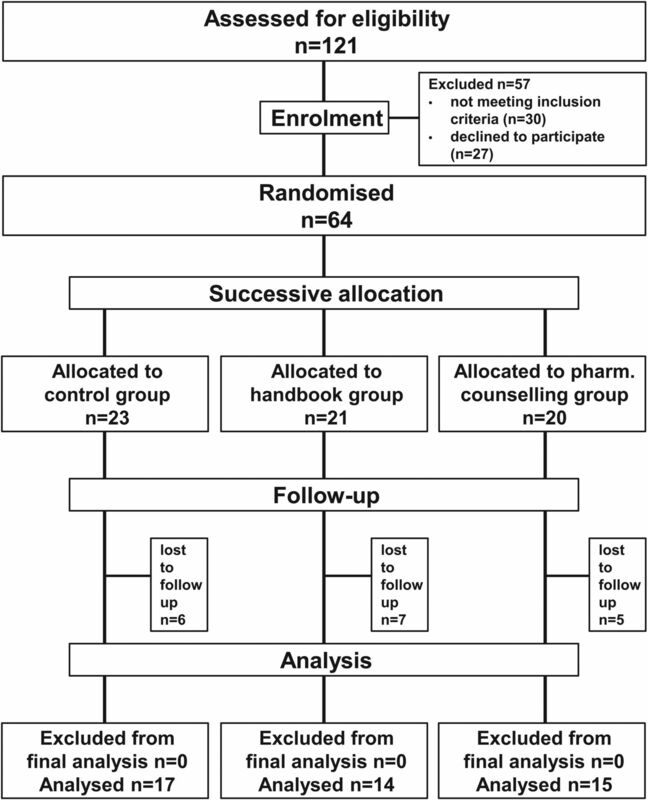 We performed a controlled, quasi-randomised, prospective intervention study. Participating patients and parents were enrolled consecutively in either the control or one of the two intervention groups to avoid selection bias. No statistical power calculation was performed owing to the pilot character of our study. A questionnaire for patients and their parents was designed to determine five items: (i) theoretical knowledge about managing medicines and (ii) storage, (iii) use of protective gear, (iv) actual practices for preparation, (v) sociodemographic data. All data were recorded and documented pseudonymously. Questions were both open-ended and multiple-choice formats. Questions related to managing medicines were based on current recommendations.14–17 Knowledge deficits were defined as the fraction of missing or incorrect answers as a percentage (%) of the maximum attainable number of points (36 points/100%). The participant's medication knowledge deficits were assigned to grades subdivided according to the US Education System: criterion reference grading system A–D, and F (A: 0–10% knowledge deficits, B: 11–20% deficits, C: 21–30% deficits, D: 31–40% deficits, F: >40% deficits). Handbook intervention. We created a 60-page handbook, in which risks and safe managing of medicines were explained. It was written in plain language and explanations were illustrated by images. The structure of the handbook designed for patients/parents is presented in table 1. Pharmaceutical counselling intervention. An experienced pharmacist explained risks and safe managing of medicines to the patient and his/her parents. The talk was given in plain language and managing of medicines could be applied by the patients and their parents. The structure of the pharmaceutical counselling intervention is presented in figure 1. 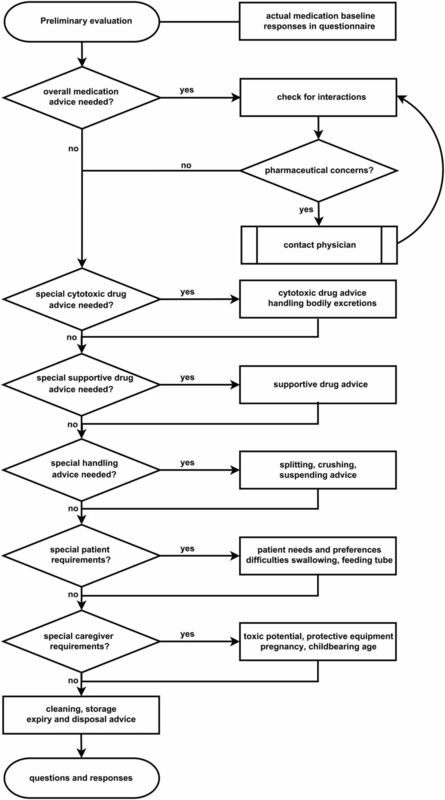 Flowchart for the structured and standardised pharmaceutical counselling of participants in the pharmaceutical counselling group. In all groups, patients and their parents received standard information on managing medicines and safety concerns from healthcare personnel as provided in routine care and the baseline questionnaire. In the handbook intervention group, participants received the illustrated handbook as soon as possible after completion of the baseline questionnaire. They were asked to read it. In the pharmaceutical counselling intervention group, a pharmacist visited patients and their parents during their appointment at the hospital or during their hospital stay as soon as possible after completion of the baseline questionnaire. The pharmacist gave instructions on safe managing of medicines, storage and safeguards. In all groups, participants received a further questionnaire (same content as the baseline questionnaire) for completion at home 3 weeks after the baseline assessment. They were asked to return the completed questionnaire in a numbered envelope to the study team. If the questionnaire was not returned in 2 weeks they were reminded by telephone and again 2 weeks later. Medians and quartiles were calculated for descriptive analysis. We reported frequencies as percentages and total numbers. Only available data were used in the analyses; missing data were not imputed. For descriptive and inferential analysis of the answers in the questionnaire we used statistical analysis software (IBM Corp, released 2011; IBM SPSS Statistics for Windows, V.20.0; Armonk, New York, USA: IBM Corp). For comparison of knowledge deficits among the three study groups a Mann–Whitney U test was performed with a Bonferroni correction for multiple testing and an adjusted p value ≤0.017 was considered as significant. The knowledge deficits within each group were tested by a Wilcoxon signed-rank test for categorical non-parametric related samples. For determination of a correlation we used the Kendall Tau-b τ according to Mukaka.18 We assumed a negligible correlation for a coefficient: 0 to ±0.3, weak positive/negative correlation: if greater than ±0.3 to ±0.5, moderate positive/negative correlation: if greater than ±0.5 to ±0.7, strong positive/negative correlation: if greater than ±0.7 to ±0.9, very strong correlation: if greater than ±0.9 to 1. Sixty-four patients and their parents were enrolled in this study (figure 2). The recruitment resulted in 23 participants in the control group, 21 in the handbook group and 20 in the pharmaceutical counselling group. Table 2 summarises the participants’ characteristics. At baseline, median knowledge deficits in the three groups did not differ significantly (control: 17% (Q25/Q75:11%/33%), handbook: 22% (Q25/Q75: 9%/30%), pharmaceutical counselling group: 24% (Q25/Q75:12%/38%), NS, respectively). At the end of the study periods, median knowledge deficits in the pharmaceutical counselling group were 8% (Q25/Q75: 6%/19%), significantly lower than deficits in the control group (19% (Q25/Q75:11%/31%); p=0.017). The deficits of 13% (Q25/Q75: 3%/27%) in the handbook group did not differ significantly from those in the controls (NS) or in the pharmaceutical counselling group (NS). During the study, the knowledge deficits in controls remained almost unchanged (17% at baseline to 19% at the end of the study, NS). Similarly, the knowledge deficits were not significantly influenced by the handbook designed for patients/parents (22% to 13%, NS). The knowledge deficits of the pharmaceutical counselling group decreased from 24% to 8% (p=0.003). We also assessed the individual increase (+) or decrease (–) in knowledge deficits of each patient/parent during the study periods depending on baseline knowledge (figure 3). We found a strong correlation between baseline knowledge deficits and the extent of deficit decrease after the intervention (τ=−0.74 p<0.001) only in the pharmaceutical counselling group. No significant correlation was found in the controls or the handbook group (controls τ=−0.34, NS; handbook τ=−0.40, NS). Knowledge deficits at baseline and at completion of the post-interventional questionnaire, subdivided according to the criterion-referenced grading system, are presented in table 3. In the pharmaceutical counselling group, high knowledge deficits graded as D and F were eliminated. In contrast, knowledge deficits graded as D were still identifiable in controls and in the handbook intervention group at the end of the study. Knowledge deficits at baseline plotted against the absolute change of knowledge deficits from baseline to the time of completion of the post-interventional questionnaire in (A) control group, (B) handbook group, (C) pharmaceutical counselling group. R2=coefficient of determination. An effect due to the pharmaceutical counselling intervention is seen as a decrease (−) of knowledge deficit. Knowledge deficits in managing oral antineoplastic agents were common, with up to 24% missing or incorrect responses to predefined relevant questions dealing with reliable administration, storage and managing those drugs. A handbook intervention did not lead to a significant decrease. A pharmaceutical counselling intervention, however, substantially reduced knowledge deficits to 8%. Participants with high knowledge deficits, particularly, benefited from pharmaceutical counselling, but not from working with a handbook designed for patients/parents. At the end of the study, all participants but one in the pharmaceutical counselling group had very good or good knowledge about the management of oral medicines. The high proportion of participants with knowledge deficits suggests that patients and their parents might be exposed to a hazard while preparing and administering antineoplastic oral drugs. This is consistent with former studies,10 ,19 showing that a high percentage of errors in the drug administration process is associated with knowledge deficits. Patients and their parents in the pharmaceutical counselling group benefited by a relative decrease of 67% of knowledge deficits, indicating a lower risk for accidental toxic exposure. The health risk due to knowledge deficits is greater if oral high-risk drugs are handled outside the clinical setting and the risk of committing errors is likely to be increased. Furthermore, inappropriate management of medicines might pose a hazard to other people in the household —for example, a patient's siblings. All participating mothers were of childbearing age and might be exposed to a risk for themselves and the unborn child without advice on the safe management of medicines. Indeed, former studies1 ,6 ,12 ,20 have shown that management of high risk medicines, particularly by parents, is prone to errors. Owing to the increasing number of oral antineoplastic drugs to be given at home, the investigation and implementation of strategies to improve the knowledge of patients and parents are urgently needed. Our study suggests strategies for improving knowledge. In contrast to the handbook group, we found that nearly all participants in the pharmaceutical counselling group had excellent and good results after the intervention, with high knowledge deficits eliminated completely. In the control and handbook group, however, one-quarter of the participants remained deficient in knowledge at the end of the study. Furthermore, this result is reinforced by the strong correlation between baseline knowledge deficits and knowledge change in the pharmaceutical counselling group, which indicates that the higher a participant's knowledge deficits were at the baseline assessment, the more these patients and parents benefited from the intervention. Consequently, for participants with the greatest need, pharmaceutical counselling is the most effective training method. In contrast, the handbook intervention did not eliminate high knowledge deficit grades. We found that the effort of developing a handbook and keeping it up to date did not succeed in avoiding knowledge deficits sufficiently. Taking into account economic considerations, we recommend focusing on patients and parents with the highest support needs (deficient and failing grade), detected by targeted questions. As a result, the workload and the effort/benefit ratio can be reduced. Efforts in a targeted counselling procedure aiming at preventing knowledge deficits and preventing errors in managing high-risk medicines are worthwhile and should be investigated further in larger studies. Our study in paediatric oncology proves that strategies to improve patients’/parents’ knowledge of managing oral medicines, as identified by a questionnaire, are urgently required. A pharmaceutical counselling strategy for patients/parents significantly reduced identified knowledge deficits, most effectively in patients/parents with the highest knowledge deficits. Errors in managing medicines posing a general risk are likely to be prevented and the safety of the person managing these medicines improved. A handbook strategy, however, had no significant effects on the knowledge deficits assessed within this study. A health risk for people who manage antineoplastic agents has been reported. Non-healthcare professionals, in particular, are affected, such as parents preparing these drugs for their children. Knowledge deficits often cause risks and have rarely been investigated. Individual pharmaceutical counselling significantly decreased knowledge deficits, particularly in patients/parents with the highest deficits. A handbook designed to provide information for patients/parents failed to produce significant results. We thank all participating patients, parents, physicians and nurses for the successful cooperation. Thanks to Katharina Schrüfer for language editing of the manuscript.
. NCCN Task Force Report: oral chemotherapy. J Natl Compr Canc Netw 2008;6(Suppl 3):S1–14.
. Patient preferences for oral versus intravenous palliative chemotherapy. J Clin Oncol 1997;15:110–15.
. Learning from error: identifying contributory causes of medication errors in an Australian hospital. Med J Aust 2008;188:276–9.
. Quapos 4: Qualitätsstandard für den pharmazeutisch-onkologische Service. Oldenburg: onkopress, 2009:232–322.
. Sicherer Umgang mit Zytostatika. 6th edn. Luzern: Schweizerische Unfallversicherungsanstalt—Suva pro, 2004. http://www.onkologiepflege.ch/fileadmin/onkologiepflege/onkologiepflege_user/pdf/fachmaterial/downloads/suva.Zytostatika.pdf (accessed 16 Apr 2012).
. Statistics corner: a guide to appropriate use of correlation coefficient in medical research. Malawi Med J 2012;24:69–71. An earlier version of the results was presented as a poster at the 38th Congress of the Association of Hospital Pharmacists ADKA, Dresden, Germany in May 2013. Contributors JZ was involved in conceptualising and designing the study, coordinating and supervising data collection and developing the intervention; carried out all the data analysis; drafted the manuscript and approved the final manuscript as submitted. DN conceptualised and designed the study, coordinated and supervised data collection as well as development of the interventions, reviewed the manuscript and approved the final manuscript as submitted. KS conceptualised and designed the study, conducted the study (including data collection and development of the interventions), reviewed and revised the manuscript, and approved the final manuscript as submitted. LF, HC WK supported the practical implementation of the study in routine care, reviewed and revised the manuscript and approved the final manuscript as submitted. RF supported the practical implementation of the study in routine care and approved the final manuscript as submitted. MPN, AB were involved in conceptualising and designing this pilot study and supported the practical implementation of the study in routine care, reviewed and revised the manuscript and approved the final manuscript as submitted. TB had the initial idea for the study and was involved in conceptualising and designing this pilot study, supervised the conception and development of the interventions, critically reviewed and revised the manuscript, including biometrical aspects of the study, and approved the final manuscript as submitted. Funding This research was supported by the University of Leipzig and the University Hospital of Leipzig and therefore by the Federal State of Saxony. DN was financed by the German National Academic Foundation; KS was supported by the Saxon Chamber of Pharmacists. Ethics approval The study was carried out in accordance with the code of ethics of the Declaration of Helsinki. Ethics approval was sought and obtained from the ethics committee of the Medical Faculty, University of Leipzig, Germany (Az: 260-13-26082013).